I’m using an EmonPI and my Emoncms software version is 9.9.8. I have two feeds (A and B) 'Logged to Feed". If I try to create a New Virtual Feed using ‘Source Feed’ and ‘Feed A’, I get the following error message: ERROR: Could not save processlist. Cannot use virtual feed as source. Am I missing something? (besides a functional brain) ? Same problem in fresh install Release emonSD-30Oct18, 9.9.8 version. @nchaveiro is the creator of virtual feeds - he might be able to help. Thanks Robert. Let’s hope @nchaveiro can help. Chaveiro multi tariff code is the best to use in Portugal. I make some test to try to identify this problem (try to eliminate users problems) and made some clean installs in emonSD-30Oct18 and emonSD-26Oct17 (all updated automatic to 9.9.8 version). Insert some base test inputs and feeds and try to create the virtual. The have the same problem. I can’t use virtual feed. I verify my old emonSD instalation and made a clean instalation with emonSD-07Nov16 (stay in 9.7.7, because update don’t work) and test again with the same inputs and feeds. I can use the virtual feed again. Of course, this version is outdated and without update, i think is better not use. Beside @nchaveiro, can some one help. I try to update my emoncms local because my base install (emonSD-07Nov16) have SD problems card and can’t generate a backup, so it’s necessary to rebuild all the system, but I verify difficulties to do the same parameters. I think it’s related to not be able to set a loop on a virtual feed to it self. 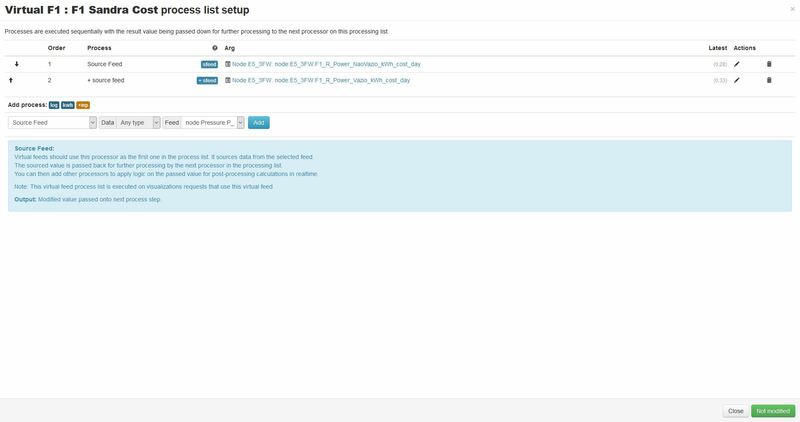 Are you trying to source the same virtualfeed on the processlist ? I think not. I try to add two feeds to have the sum in day cost. Nevertheless, I try to add source feed; + source feed with all my feeds and no one works. I send the image of the old config and the new (try to reproduce the same). Like write, I made full clean installs and try some test feeds and always have the same problem. Create the example standards physical inputs from API help, generate the the correspondent feeds. No customization made in the creation. When try to create the virtual feed, with this feeds, the error occurs. I think in fact is a bug from the last update made by @TrystanLea, like you explain @nchaveiro. It’s possible to correct this update @TrystanLea ? Can you raise an issue on Github and reference it to here please. I have had a look and proposed a solution PR @TrystanLea @glyn.hudson @Gwil.